It is alleged that Arya, between January 1, 2014 and December 31, 2014, in Suva, while being em­ployed in the public service as the Registrar at the University of Fiji and while acting as the School Manager for Bhawani Dayal Me­morial Primary School, did arbi­trary acts for gain in abuse of the authority of his office. The three-week trial of Regis­trar of the University of Fiji Kamlesh Arya began at the High Court in Suva yesterday. Arya is charged by the Fiji Inde­pendent Commission Against Cor­ruption (FICAC) with one count each of abuse of office and general dishonesty. Arya appeared before Justice Ri­yaz Hamza yesterday represented by lawyer Vijay Maharaj and Queens Counsel Gregory Woods. The prosecution is represented by FICAC lawyers Sam Savumiramira and Laite Bokini. 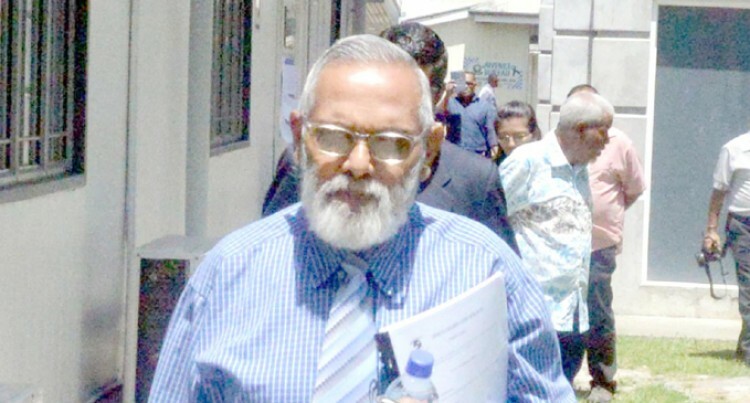 Arya pleaded not guilty to the charges and the trial proper began in court with FICAC’s first prose­cution witness and former Perma­nent Secretary for the Ministry of Education Dr Brij Lal. In the opening submission, Mr Savumiramira addressed the court that as a public servant, Arya used the free education grant for other purposes without authorisation. Mr Savumiramira told the court that Arya authorised the free edu­cation grant amount of $116,500 from Bhawani Dayal Memorial Pri­mary School as loans to University of Fiji, Bhawani Dayal Arya Col­lege and Vunimono Arya School in 2014. The trial continues before Justice Hamza today. It is alleged that Arya, between January 1, 2014 and December 31, 2014, in Suva, while being em­ployed in the public service as the Registrar at the University of Fiji and while acting as the School Manager for Bhawani Dayal Me­morial Primary School, did arbi­trary acts for gain in abuse of the authority of his office, namely authorised loans amounting to $116,500 from the Free Education Grant provided by the Ministry of Education to Bhawani Dayal Me­morial Primary School, which was prejudicial to the rights of the min­istry and Bhawani Dayal Memorial Primary School. It is also alleged that between the same period, in Suva, while being employed in the public service as the Registrar at the University of Fiji and while acting as the School Manager for Bhawani Dayal Me­morial Primary School, dishonest­ly caused a risk of loss to Bhawani Dayal Memorial Primary School by authorising the Free Educa­tion Grants as loans amounting to $116,500, and knowing that the loss would occur or substantial risk of the loss would occur to Bhawani Dayal Memorial Primary School.